The 24/7 Dad is Self-Aware: The 24/7 Dad is aware of himself as a man and aware of how important he is to his family. Read more about The Importance of the Self-Aware Father. The 24/7 Dad Cares For Self: The 24/7 Dad takes care of himself. Read more about The Oxygen Mask Rule of Fatherhood. The 24/7 Dad Understands Fathering Skills: The 24/7 Dad knows his role in the family. Read more about the 3 Things You Should Do > Because You're Being Watched. The 24/7 Dad Understands Parenting Skills: The 24/7 Dad nurtures his children. Read Pretty Much Everything You Should Know to be a Master Nurturer. The 24/7 Dad Understands Relationship Skills: The 24/7 Dad builds and maintains healthy relationships with his children, wife/mother of his children, other family members, friends, and community. Recall the great news? These five traits have a guarantee: master each of them and you are a 24/7 Dad. Let's talk about trait five, a dad and his relationship skills. Well, let's keep this realistic. We can't fix everything related to relationships in one post. But, we can make progress on communication. For the last several posts, we've talked about how you, dad, are unique and irreplaceable in your child's life. When it comes to parenting and your relationship to your child and your child's mom, it's no different. The 24/7 Dad Understands Relationship Skills. The 24/7 Dad builds and maintains healthy relationships with his children, wife/mother of his children, other family members, friends, and community. He knows and values how relationships shape his children and their lives. The 24/7 Dad knows how the relationship with his wife/mother of his children affects his children and creates a good relationship with her for the sake of his children. He always looks to improve the skills he uses to communicate with others. The 24/7 Dad communicates his thoughts, feelings, and actions on a daily basis in a way that respects others. Still, one of the greatest challenges 24/7 Dads face in raising their children is how to better communicate. What makes the 24/7 Dad different from other dads is that he understands problems with communication start with him and no one else. Odds are good you didn’t wake up this morning and say to yourself, “You know, I should communicate with my kids better...” While you know the importance of communication, you probably need a reminder every now and then that how you communicate daily is of utmost importance. 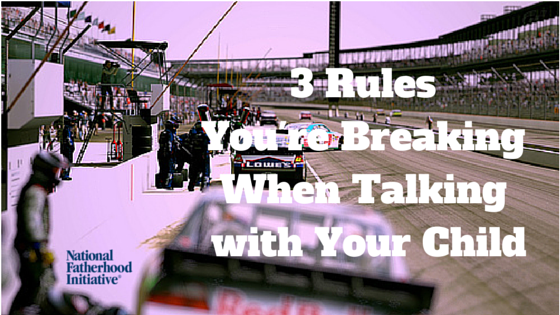 Reframe your idea about what communication is and change the word “communication” to “racing.” With racing, there are three rules professional drivers follow that totally apply to talking with your child. How you race depends on the track. Drivers know there are four types of racetracks, and they treat each track differently—mainly because each track requires a different strategy. 1) Short tracks > These tracks are shorter than one mile and take a more physical strategy. In short-track racing, there’s more bumping of cars. If you’re the dad of a new baby, one of your main strategies should be physical touch. Hold your baby as much as possible. Communicating during this stage in your child’s life is as much about cuddling than it is about talking. 2) Intermediate tracks > These tracks are usually between one and two miles. They’re challenging, but somewhat “routine” in that all of these tracks are made up of four left turns. The dad of a school-aged child understands the importance of establishing daily routines when it comes to connecting with his child. During this time, you’re busy and so is your child. So every moment must count. 3) Superspeedways > These tracks are usually two miles or more. They’re the fastest of all the tracks in professional racing. The dad of a teenager understands just how fast time passes at this stage of his child’s life. Communication during this stage must take on great quality; because often, the fast pace of life as the dad of a teen may seem to reach speeds of over 200 miles per hour. 4) Road Courses > Only the most experienced drivers do well on road courses. As a dad of a college-age child and/or beyond, you will have more “turns” than the other three dads. At this stage, it will be how well you maneuver through the turns that will give you a successful outcome. Become an expert on the track you are racing for each stage in your child’s life. While you can prepare somewhat for what will happen, you must complete many laps around the track to gain the experience you need for effective communication with your child at any age. Rule #2—Practice, Practice, Practice. And then Practice Some More. When drivers aren’t “on the track,” they practice. Their work is about more than that short moment on the racetrack. All of their time leading up to the race is spent on practice. When is the right time to practice? Early and often. Just like the best drivers raced cars when they were young, you must spend time and talk with your child early and often. It’s never too early to talk and listen to your child. Spend time with your child and have a purpose in what you do during your time together. Seize every moment to get practice. Drivers know success isn’t simply about practice and performing well on the track. The best drivers know the importance of making adjustments. Adjustments are crucial in racing. A driver that can’t lead his team to make mid-race adjustments won’t win. Likewise, you will learn to be a dad by trial and error. You will make mistakes. Things will go wrong. Great drivers know the importance of making adjustments, from research and development in the off-season to communicating the necessary adjustments to his team during the race. Research and development is the science behind the racing. If you toured a NASCAR research facility, for example, you typically won't see the driver and the car together. Likewise, you will need to study fatherhood, even if you don’t live with your child. Become a student of fatherhood. Learn from books, articles, magazines, and more experienced dads. As a racecar driver, how you race depends on your knowledge and skill of the track, the amount of time you practice, and the amount of effort you use to make adjustments. With the right skills, experience, and practice, you can be successful with any track...err...with any child! The 24/7 Dad asks himself: How well do I relate? Please go here to buy the shirt! Then, share pics of yourself or the dad in your life using #247Dad on Facebook, Twitter, and Instagram. Fatherhood leaders > Wear this unique t-shirt to show how proud you are to be a leader. Give it to dads who attend your program or as a graduation gift. Dads, Moms, & Children > Wear this shirt to show your passion for fatherhood and inspire those around you to live as responsible fathers. Or, give as a gift to a dad you know. Question > What does being a 24/7 Dad mean to you?